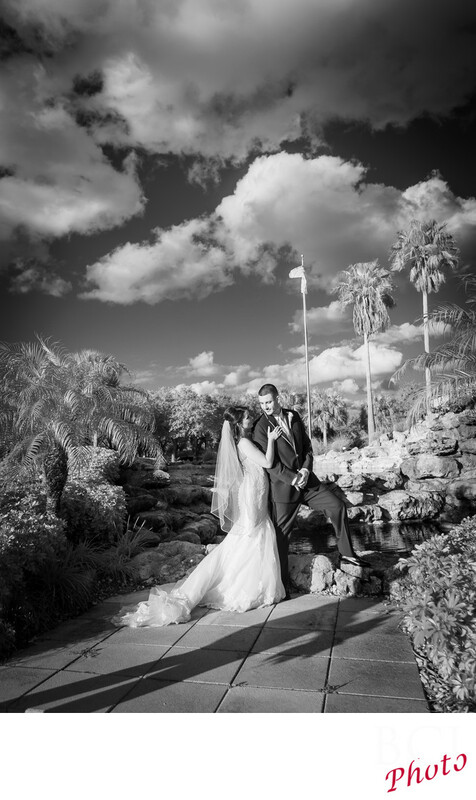 Another infrared wedding image shot at The St Lucie Trail Golf Club in Port St Lucie, Florida. As you can see we chose to make this infrared image a monochrome. This time in the black and white rendition. We also do these in chocolate, strawberry (yes red) toned, and even our cool Blue Jean tone. Also popular are our "false color" infrared images where the skies remain blue as natural, but the rest is monochrome for a striking yet other worldly feeling image. Most folks are familiar only with the black and white variety of infrared images. Still among our most popular renditions as well. Here our bride looks lovingly up at her new husband as they pose in front of the waterfall at the st lucie trail golf club. This iconic spot has been there since the club was built, and has always been a must have shot. Formerly the PGA Country club, it is still owned by the PGA, but now is open to the public. With gorgeous ceremony site locations overlooking the lake, and a terrific room upstairs which overlooks the course and lake scenes, its one of the most popular and best value wedding venues on the treasure coast.